We’d love your help. Let us know what’s wrong with this preview of Tacky the Penguin by Helen Lester. To ask other readers questions about Tacky the Penguin, please sign up. is it a modern fiction? HOW MANY TOES DOES A FISH HAVE? AND HOW MANY WINGS ON A COW? This is a mildly funny and sweet story about an unconventional penguin and his conformist peers. For me, the names of all the penguins were the most amusing part of the book. This book has some good messages: that being odd or different and being your own person can be a huge positive, and that it’s worth it to make friends with those who might, on the surface, seem weird in any way. It could make a great read aloud book for groups of children to discourage them from ostracizing anybody. Along wit This is a mildly funny and sweet story about an unconventional penguin and his conformist peers. This book has some good messages: that being odd or different and being your own person can be a huge positive, and that it’s worth it to make friends with those who might, on the surface, seem weird in any way. It could make a great read aloud book for groups of children to discourage them from ostracizing anybody. Along with these lessons, it’s simply a fun book. This is a great book to show that being different is a good thing. Tacky is an odd bird among his companion penguins, Goodly, Lovely, Angel, Neatly, and Perfect. They did everything right. They marched at a perfect beat while Tacky did his own thing. They sang with beautiful voices while Tacky sang his own off-key song. They were always thinking how different he was and why he wasn't like them. Well when hunters came looking to find the perfect penguins, Tacky came to the rescue. Because he was This is a great book to show that being different is a good thing. Tacky is an odd bird among his companion penguins, Goodly, Lovely, Angel, Neatly, and Perfect. They did everything right. They marched at a perfect beat while Tacky did his own thing. They sang with beautiful voices while Tacky sang his own off-key song. They were always thinking how different he was and why he wasn't like them. Well when hunters came looking to find the perfect penguins, Tacky came to the rescue. Because he was different, he convinced the hunters that the bunch of them couldn't possibly be the perfect penguins because of the way he marched, and the song he sang off key. In the end, Tacky saved the day as the hunters ran away with their ears covered. This book truly shows how being different is not bad at all and everyone has their own personality, and perhaps being different will be a great thing one day. Tacky is an odd bird. Yeah, I just don't dig it. Perhaps that's why none of the kindergarteners this year and last seemed to dig it either. Can you sense ambivalence? I tried it last year when I was trying to build my kindergarten readaloud list (so many places recommend it) and it bombed a bit. Same thing happened this year. Yes, I put energy into my reading. Tacky's an interesting characters, one with lots of promise. However, I didn't find the book funny. The plots a little odd. I don't parti Tacky is an odd bird. Tacky's an interesting characters, one with lots of promise. However, I didn't find the book funny. The plots a little odd. I don't particularly like the other penguin's names (6 year olds don't get the joke) nor did I like reading them in one long breath. My son loves this book. He's a reluctant reader, but he reads this one multiple times a day. He even read it to his father while his father was doing the dishes so that his father could "imagine the pictures." Tacky the Penguin by Helen Lester tells the story of Tacky, a very different penguin than his friends. His friends are named Goodly, Lovely, Angel, Neatly, and Perfect. It's obvious right away just by his name that Tacky doesn't fit in. As you read about Tacky, he does everything different than the other penguins. They dive gracefully, but Tacky cannon balls in. They march in step, and Tacky is all over the place. 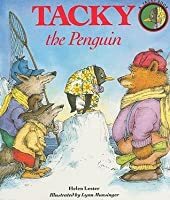 One day though, hunters come to where the penguins live looking to trap them for m Tacky the Penguin by Helen Lester tells the story of Tacky, a very different penguin than his friends. His friends are named Goodly, Lovely, Angel, Neatly, and Perfect. It's obvious right away just by his name that Tacky doesn't fit in. As you read about Tacky, he does everything different than the other penguins. They dive gracefully, but Tacky cannon balls in. They march in step, and Tacky is all over the place. One day though, hunters come to where the penguins live looking to trap them for money. The other penguins hide, but Tacky approaches the hunters and begins to show that there are no penguins. Tacky begins to sing off key (penguins are known for their beautiful singing) and the other penguins begin to join in. The hunters run away when they can't take it anymore, and the penguins quickly realize that Tacky is a great penguin to have around. I loved reading about Tacky, as I never had before. This is a great story to read to teach students that it's ok to be different from everyone else, and that sometimes your differences may help you in certain situations. On the cover is a border image of a picture from the story. Tacky is face to face with the hunters in his Hawaiian shirt. The background color is blue, reminding me of the glacier setting. On the back are the "normal" penguins with their noses in the air and Tacky simply walking behind them. The cover page has Tacky doing a cartwheel, which is from the story as well. There is a mix between full-bleed images and border images. At some points, the border image blends into the background and it is hard to distinguish when there is a border. The images are simple, but they showcase how different Tacky is. One of my favorite pictures if Tacky in his swim suit with an inner tube as he waits in line for the other penguins to dive in so that he can do his cannonballs into the water. The pictures always have Tacky with a smile on his face, while his friends are very stuck up. They often have their noses in the air, and their names add to the fact that they think they are better than Tacky. 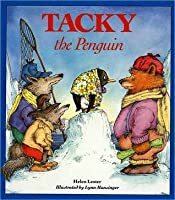 Tacky stands up for himself when the hunters come, and the other penguins only join in when they realize that they need to make the hunters go away. Tacky saved the penguins, and they were grateful at the end. If I were Tacky I would be happy that I was different, and that I was able to save my friends from the hunters. By the end of the story I wanted to read it again and fell in love with Tacky and his ability to be different than his friends. This story teaches a great lesson, and I think any student would enjoy reading this book. This book was about a penguin who marches to his own drummer. A good book to use to teach kids it's ok to be different, very funny, kids loved it. If you read it in a crazy voice children will fall in love with this book. Last year's class would sing "How many toes does a fish have?" at recess. Go figure. Tacky is most definitely one of my favorite characters from children's literature. I suppose I should start by saying that if it were possible to have a fictional spirit animal, Tacky would probably be mine. He is a bit odd. He does not quite fit in with the other pretty penguins. He marches to the beat of his own drum (1-2-3, 4-2, 3-6-0, 2 1/2, 0). Nonetheless, Tacky always turns out to be a good bird to have around. https://booksonmycat.word Tacky is most definitely one of my favorite characters from children's literature. I suppose I should start by saying that if it were possible to have a fictional spirit animal, Tacky would probably be mine. He is a bit odd. He does not quite fit in with the other pretty penguins. He marches to the beat of his own drum (1-2-3, 4-2, 3-6-0, 2 1/2, 0). Nonetheless, Tacky always turns out to be a good bird to have around. Adorable and funny. Just be yourself and don't worry about whether you "fit in" or not. A very sweet book. Tacky is silly and funny. It’s a good book that kids laugh at. It’s nice to realize that it’s ok to be silly and odd because you can still be a good friend. This book teaches children that it is okay to be different. It has fun colorful pictures and repeating lines that the children could learn, for an interaction piece. Tacky even dresses different than the other penguins which I thought was a unique twist on being different. You should never judge a book by its cover! To his friends, he seemed odd but his "odd" behavior wound up saving them. This book teaches children to treat others how you would want to be treated. Great message for young children! This story teaches young children that it is okay to be different and unique. It shows that it does not matter what someone looks like, but rather how selfless, brave, and kind he or she is. This story also introduces suspense, rhyming, and a variety of vocabulary words. 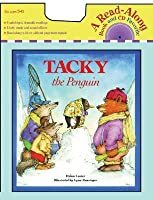 Tacky the Penguin by Helen Lester, illustrated by Lynn Munsinger, is the first of a series of books about Tacky (a nonconformist) and his graceful, well-behaved companions: Goodly, Lovely, Angel, Neatly, and Perfect. TAcky's behavior, loud Hawaiian shirts, loud singing, & splashy cannonball dives initially puts off his companions. But when the hunters arrive, it's Tacky's antics that save the day. This is ome of my favorite funny read-alouds. 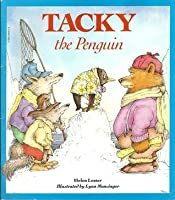 Kids enjoy the loud, slightly obnoxious behavior o Tacky the Penguin by Helen Lester, illustrated by Lynn Munsinger, is the first of a series of books about Tacky (a nonconformist) and his graceful, well-behaved companions: Goodly, Lovely, Angel, Neatly, and Perfect. TAcky's behavior, loud Hawaiian shirts, loud singing, & splashy cannonball dives initially puts off his companions. But when the hunters arrive, it's Tacky's antics that save the day. This is ome of my favorite funny read-alouds. Kids enjoy the loud, slightly obnoxious behavior of Tacky, and how quickly he puts the rough, gruff hunters in their place. The illustrations by Lynn Musinger perfectly show the oddities and madcap behavior of Tacky. I love the picture of Tacky having a mackerel sandwich, his splahy cannonball, and the two page spread of the hunters. Lester's text is a hoot with the contrast of the clone-like Goodly, Lovely, Angel, Neatly, and Perfect, and the exuberance of Tacky. Her hunter's song and Tacky's How many Toes Does a Fish Have are classics. Themes include friendship and being an individual. Oh, cute! I like this one by the author of "Hooway for Wodney!" Really cute story. And I like the pictures, too. And a nice little moral tucked inside. 6/22/10 & 6/24/10 Fabulous choice for storytime! They loved it. And I had such fun reading the narration, doing voices, and "singing" the songs. I think the children were highly entertained by my reading. (I entertained myself!) And I believe they enjoyed the story, too. 4/18/12 Wonderful wind-up to my Adventures! theme. Of course, it would hav Oh, cute! I like this one by the author of "Hooway for Wodney!" Really cute story. And I like the pictures, too. And a nice little moral tucked inside. Hey! That reminds me of a story about a funny little penguin named TACKY! 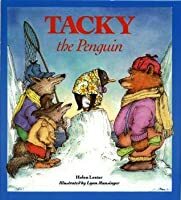 Tacky the Penguin is a great book to read aloud but is even better to listen to on CD. This is great for ages 4-8 and the illustrations capture the mood of each penguin in a whimsical and colorful way. Helen Lester does a great job bringing Tacky, a loud odd penguin to life. Tacky lives with a group of five formal and proper penguins but Tacky is nothing like them. His antics confuse his friends until one day they hear a thump…thump…thump. In this book you will find out how a loud, odd penguin s Tacky the Penguin is a great book to read aloud but is even better to listen to on CD. This is great for ages 4-8 and the illustrations capture the mood of each penguin in a whimsical and colorful way. Helen Lester does a great job bringing Tacky, a loud odd penguin to life. Tacky lives with a group of five formal and proper penguins but Tacky is nothing like them. His antics confuse his friends until one day they hear a thump…thump…thump. In this book you will find out how a loud, odd penguin saves the day from a mean pack of hunters. This is a great book to use in the classroom to teach about being an individual. Students will get a great laugh while learning that it’s wonderful to be different even if others do not notice it right away. The message "it's okay to be different" is a popular one in the world of picture books. Unfortunately, it's usually paired with vivid examples of people harassing the different person - comes a point in Rudolph, for example, where I wonder why the red-nosed reindeer agreed to help any of them! Tacky manages to avoid that. Tacky is different from the other penguins, and doesn't fit in, but they don't go out of their way to make him feel bad for that. And then, of course, his differences go on to s The message "it's okay to be different" is a popular one in the world of picture books. Unfortunately, it's usually paired with vivid examples of people harassing the different person - comes a point in Rudolph, for example, where I wonder why the red-nosed reindeer agreed to help any of them! Features: repetition, interesting pictures with facial expression. There's singing, so it makes it fun to do the voices. Fun read! Moral: it's good to be different or to be tolerant of others' differences. This book was a great read especially when dealing with diversity of any kind. Everyone is their own individual and should not be placed in the same category even if of the same religion, ethnicity,etc. Tacky was deffinetly an odd penguin but in the end he saved the day and was so loveable. Tacky was an odd bird. It is a simple truth. My family has gotten a lot out of this book, and I believe it is the best out of all of the Tacky books. The best part is sometimes if I just do something random, my parents will look at me for a moment and say, "Tacky was an odd bird." Very good book. Our son loved this book. Great for 5 and 6 year olds. Tacky seemed an odd bird to the other penguins but sometimes having a renegade in the crowd has benefits for the whole group. Cute and funny. This is a book that can be read during circle time. The meaning of this book can teach children that it's okay to be different and just be who you are. The illustration was very detailed.